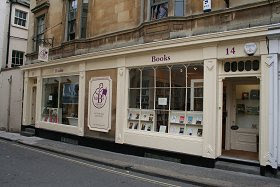 Susanne said: "I wanted to write to recommend our fabulous local bookshop: Mr B's Emporium of Reading Delights in Bath. It has one of my favourite names for a bookshop and, even better, it does exactly what it says on the tin. It is filled with carefully selected stock that covers a wide range of tastes and reading requirements - fiction and non-fiction - something to delight everyone. And if they don't have it they can get it for you very quickly - often the next day and much quicker than the chain stores. The staff are all well and widely read and always willing to have a chat and recommend books to you. Their diverse interests mean that there is bound to be someone who can help if you have a question. But there is no hard sell - they love their books and want to share the pleasure of reading them with you. It is a beautiful shop on three floors of a Georgian building, very light and airy with the stock well displayed. I love the innovation of the Bibliotherapy room upstairs with comfy chairs in front of a fire and free coffee and tea to sip whilst your browse. And if you don't know what you want, or need an unusual present for a book loving friend they offer a Reading Spa - time with a book seller to discuss your likes and reading habits so that they can make recommendations and then money to spend on books. And in case you were wondering, after this glowing review, I'm not involved in the business or related to anyone who is! But we have been massive fans of this shop since it first opened in 2006 and filled a very big gap in the market in Bath. 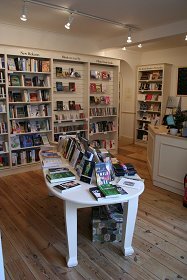 And we must not be the only ones who love it as it has won several awards, including Independent Bookshop of the Year 2008 - not bad for such a new shop!" After such a glorifying and thorough recommendation, we have almost nothing left to add but perhaps a few technical details about this award winning bookstore. They pride themselves in excellent service, ordering even your most difficult hard-to-find books within one or two days. As for their stock, we were assured that every book is hand-picked for the aim of Mr B's is "to promote reading indulgence". Categories such as fiction, history, biography, travel, philosophy, poetry and a children's section all find their place in the book haven. Mr B's Emporium also holds regular book readings and signings and one of their most notable guests was Yann Martel, the author of the Man Booker Prize winning novel The Life of Pi.